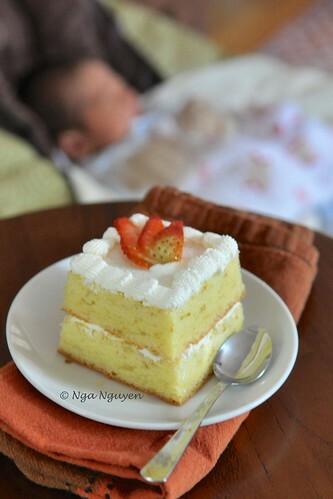 Japanese cotton sponge cake – Come on in, I hope you are hungry! Me: How long does it take to the airport? Half an hour maybe? Him: No, less than that. Line a 9″-round pan with parchment paper. In a small bowl, whisk all-purpose flour and cornstarch. In another small bowl, use a fork to mix 4 egg yolk with vanilla extract and lemon zest (if using). Boil water in a small pot over high heat. Place a medium bowl on top. Add milk, butter, and oil. Whisk constantly until mixture becomes warm to touch. Turn off the heat, and place the bowl of butter mixture on the counter. Quickly add flour + cornstarch. Whisk until combined. Add egg mixture. Whisk until combined. In another medium bowl, beat egg white with 1/2 tsp of cream tartar and salt. Slowly add sugar and beat until stiff peak. Take 1/3 part egg white and mix with egg yolk mixture in step 8. Carefully fold another 1/3 part egg white into batter. Finally, fold the rest of egg white into batter. Immediately invert cake to cool on rack. Pingback: Fraisier cake – Come on in, I hope you are hungry!